My name is Corey Fergus. 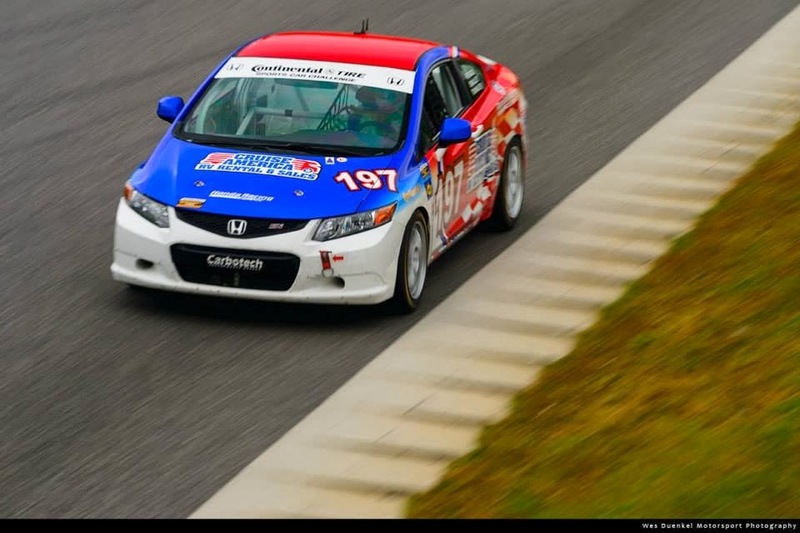 I race the #197 Honda Civic Si for RSR Motorsports in Grand-Am’s Continental Tire Sports Car Challenge ST class with co-driver Owen Trinkler. 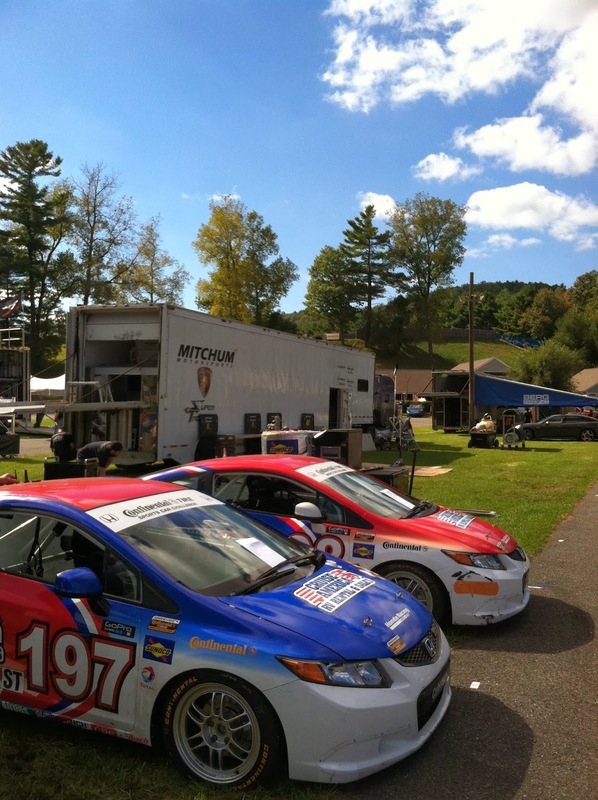 Our 11th and final race of the season took place in Salisbury, CT at the 1.53 mile Lime Rock Park. This event is always a little unique as there is a church located right next to the track. This means no racing on Sunday, which really bunches up the weekend schedule. 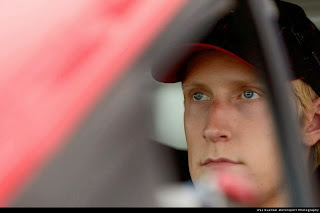 For us, it meant that everything (practice, qualifying, and the race) took place on Friday. With only 45 minutes of practice before qualifying, it meant that the car had to essentially role off the trailer ready to race. Therefore, we didn’t have much time to work on the setup. Heading into the season’s final race I knew we were out of the championship. I’ve had an incredibly unlucky season with some mechanical difficulties and being crashed out as well. Things certainly hadn’t been going my way. I was hoping for a top 5 finish at least. I wanted to prove that we could finish well, not just be fast. Interestingly enough, I had never raced at Lime Rock in the dry. Last year’s race was a complete washout. You couldn’t see a thing when driving. This year, the forecast was great, with gorgeous weather and the leaves already changing in September. Since we had little practice time and I’d never raced in the dry, I used iRacing’s simulation service to prepare myself for the event. So my first lap in the dry felt like my hundredth. In practice, everyone was pretty close in lap times. With such a short track, the times were under a minute! We made a change for qualifying and hoped for the best. Like almost every qualifying this year, I was on the pole for at least part of the session. It lasted one lap for this one. On the last lap I got jumped a few more cars as well, so I was to start 5th. The next Honda was 10th, which was the #75 Compass 360 Civic, second in the championship. I had a great start for the race, moving into 4th on the first lap. Very uncharacteristic of our series, there wasn’t a yellow at the beginning of the race. We ran under green for a long time. After a while, the car started to fall off pretty significantly. I made the decision to wave a few cars by when they got close enough, so as not to screw us both up. There was no sense holding them up, when their car was clearly quicker. I dropped back to 7th. About an hour into the race, going in to Turn 1, I got hit by a Mazda MX-5 that had “brake problems” and it broke our right front suspension. Another race ruined; definitely a frustrating end to a frustrating season. We always had a fast car, but in the final results it rarely showed. In the fight for the championship, it came down to the wire. In the end, the #75 Honda got beat out by the #23 BMW. So, a 2nd for Honda in the Driver’s championship and a 3rd place finish in the Manufacturer’s championship. The Honda’s were a lot stronger than the results showed this year. Our team especially was consistently the fastest Honda team, but couldn’t convert when it counted. On to the next season. Hopefully I’ll be back in a Honda.